Besides, Windows 7 still has 46.63% usage, according to https://www.netmarketshare.com/operating-system-market-share.aspx?qprid=10&qpcustomd=0, and Windows 10 only has 29.26% usage. I just posted all of my instructions to build an AppX with my tweaks and improvements on GitHub. I will post a copy here. Make sure a proper base image is installed, run DesktopAppConverter app as Admin. Always rename a build, once completed, to have the date added at the end. This is important - the “npp.build” folder should only be used for latest build. Now, copy the AppxManifest.xml file from the previous build, overwriting the AppxManifest.xml that is in the current folder. If this is your first build, don’t do this, and edit AppxManifest.xml to match the file listed at the bottom of this post. Edit the newly-copied AppxManifest.xml file, updating the version number on line 3. Don’t make any other modifications. NOTE: When doing this for the first time, you must add C:\Program Files (x86)\Windows Kits\10\bin\10.0.16299.0\x86 to the Path attribute in Environment Variables for this to work, and restart PowerShell. If you are using a different build than 16299, you should open the folder in File Explorer and adjust accordingly. A) Copy the certificate already generated (see below if this is your first time) from your previous build into the npp.build folder. If doing this for the first time, you must generate a private certificate on your computer, then copy the .pfx and .cer files into the npp.build folder, then use that to sign. To clarify, the .cer is the public key (the exported one), whereas the .pfx is used for signing and is private. You must have the Environment Variable in Step 7 set for this to work. You only need to generate the certificate one time. After this, again, just copy-and-paste the certificate from the previous build into the new one. A) New-SelfSignedCertificate -Type Custom -Subject "CN=<YourNameHere>" -KeyUsage DigitalSignature -FriendlyName <Your Friendly Name> -CertStoreLocation "Cert:\LocalMachine\My"
G) Open “Manage Computer Certificates” from Search box in Windows 10. K) Update your AppxManifest.xml file to use “CN=YourNameHere” and update your publisher names in that file. L) Go to the top, part B above this. Run signtool using your newly-generated .pfx. Double click the .appx just generated, and click Install. This is the default AppX. When building a build for the first time, you must copy and paste this AppX over the generated one. Copy and paste this in to AppxManifest.xml for the first build. To clarify, you must copy this over the AppxManifest.xml file on your first build, then copy the AppxManifest.xml from the previous build every time you make a new build. Not sure about what are you talking about. 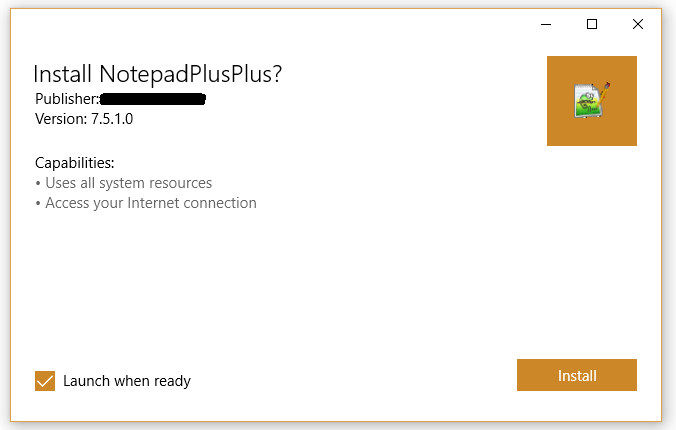 If you’re talking about the way to get Notepad++ installed, there will be the same distribution way via notepad-plus-plus.org, plus Windows Store’s distribution. So users have more choice. works well, and install the new image without problem. Thank you. I’ll let you know if I can make an UWP package. I have tried Windows convension Bridge several times, I have never managed to get UWP from it. In anyway, it’s impossible to build any distribution from a 3rd party server, not only for the reliability reason, but also for the security reason. Thank you very much for the very detail info. It helps me a lot. What do you mean? Do you mean that Notepad++ remixes can’t be built? Or are you talking about something else? Great! I don’t want to make things to complicated, and you can just use that simple command, but it won’t be an ideal experience without the modifications I put in those instructions (the main change is that you can open files from File Explorer, because file associations as they were done in the past don’t work, and without this you would have to go File > Open for every file you wanted to open). @donho If you meant that you never got a successful result from the bridge, that is odd. In my case, the biggest issue I had was needing Windows 10 Pro (because Home doesn’t include Hyper-V). Remember, Desktop-converted apps require special permission from Microsoft to be published. They charge $19 for an Individual’s Store account (this is for everyone), and they don’t charge for publishing converted Desktop apps, but they do require you fill out a special form asking for permission. After all, desktop apps (even packaged as UWP) still have far more control over the system than regular, new UWP apps do. In fact, Microsoft would prefer you filled out this form sooner than later, by the sound of it. It is also implied that they will help with any problems or questions. Also, they have a tendency to actually seek out apps they deem important and ask their developers to bring them to the store - they would probably really want you to bring Notepad++ to the store and would probably be more than happy to help you.